Black Sheep Brewery – Yorkshire Gold – Beer Oh Beer! 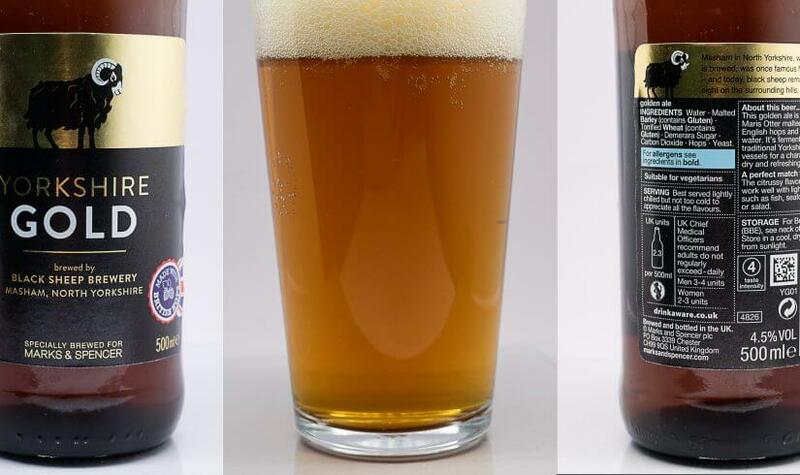 The Beer: Malty and nutty light aroma; Clear, golden-brown in colour, little or no visible carbonation, frothy head quickly goes; the nutty and malt aroma come out in the taste, light syrup taste; lighter bodied, smooth at first but tending towards a little too much carbonation. Thoughts: I’ve been drinking fine Yorkshire beers for the last week, mainly on tap which went down smoothly and very well. This is a good effort and one of Marks & Spencer’s UK beers. I reckon I’ve had some Black Sheep Brewery beers before and rate them highly (we even went through Masham a few times last week). Worth having if you are stuck in M&S and in need of a beer to buy.